Back in the late 1700s Congress passed a law that allowed American citizens to make claims against Indian tribes for property that was damaged or stolen in Indian raids. Requirements were tweaked over the decades, and Broome’s latest book, Cheyenne War: Indian Raids on the Roads to Denver, 1864-1869, attempts to capture and record some of the accounts filed over a five-year span. Ariane wrote about this book last summer. Numerous National Archive visits allowed Broome to access the files. He pored over them one box at a time, taking ten years to collect the information he needed to write this book. However, Broome felt there were many citizens that missed out. Once this law was changed, a requirement of having a witness arose. “They had federal agents with the Department of Interior, and they would go out in the field with these claims and interview people to see whether the claims were true,” Broome said. Many accounts that came out later were wrong, and Broome strove to correct them. He did not want to leave anything out and wanted to ensure he did not make mistakes. To place these events in their proper sequence, Broome double-checked claims with other evidence he could find. He said that many times people filed years after the incident, and recorded dates incorrectly. Few Indian voices from the time period Broome studied left him with George Bent as a major resource, along with other linked claims. “I would compare what he says about events to other claims,” said Broome. For Broome, writing the book was a learning experience, and he discovered that his audience is not just historians, but people interested in their roots. Broome chose Aberdeen Books of Sheridan, Colorado, to work with him on the publishing process. The limited edition, which has marbled boards and cowhide spine and corners, comes in a cloth slipcase. Fifteen signed and numbered, special-edition books will be coming out soon, as well. Excitement was in Broome’s voice as he described the limited edition copies. 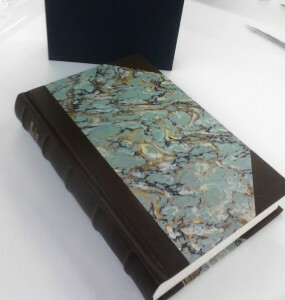 The spine and corners are bound in dark brown cowhide, with robin’s-egg blue marbled paper and a navy linen slipcase. Each copy is signed by the author and numbered. Broome actively promotes his books himself, traveling around the United States to speak at various events. Broome explained that two books are produced every three minutes, calculating to over one million per year.